Gruyère, Ham, and Spinach Strata - Home. Made. Interest. 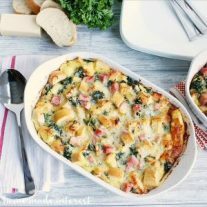 This Gruyère, Ham, and Spinach Strata mixes the sharp, nutty flavors of fresh grated cheese with the smokey taste of Black Forest Ham. I love anything that you can make ahead of time, especially when it involves feeding guests. We’re gearing up for the holiday season and my brain is already filled with breakfast, dinner, and dessert ideas…sorry lunch, dessert wins during the holidays! I absolutely love brunch so I like to try out one or two new recipes before the holidays start. For me the key to a good breakfast or brunch recipe is something that can be made ahead of time. Especially if I’m making it for a large group of people. Enter strata. I’ve never made one but after trying this recipe out it is definitely going to be on my menu this year. 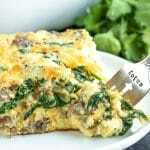 A strata is similar to a frittata or quiche. 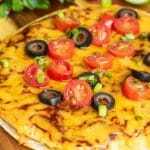 It is made with bread, eggs, and cheese, along with your choice of meats and/or vegetables. 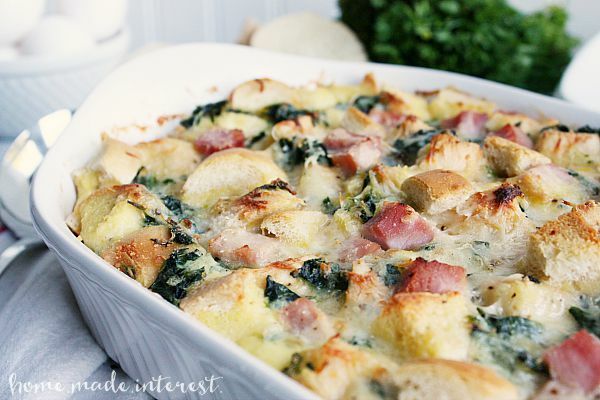 I chose to make my strata with gruyère, Parmigiano-Reggiano, Boar’s Head SmokeMaster™ Black Forest Ham, and spinach. I love pairing the rich smokey taste of the ham with the delicate flavor of gruyère, and the stronger, slightly nutty flavor of Parmigiano-Reggiano . 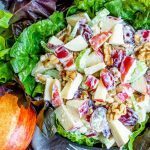 It gives any dish a depth of flavor that makes it a sure favorite. Boar’s Head SmokeMaster™ Black Forest Ham is crafted with the finest ingredients and exceptional care. It is naturally smoked with imported German beechwood resulting in a ham with a delicious, distinct flavor that is rich and smooth. I found it in the deli section of my grocery store and instead of having it sliced thin I asked them to cut it into 1 inch thick pieces. When I got it home I cut it and my french baguette into 1 inch cubes, and in a separate bowl I combined my two cheeses. I cooked onions and spinach together, then layered everything in a casserole dish and topped it with an egg mixture. The whole process took about 30 minutes but the best part about the recipe is that you make it ahead of time. Once you have all of your ingredients in the casserole dish you cover it and put it in the refrigerator for at least 8 hours, up to 1 day. The next day you take it out of the refrigerator and bake it for 45-55 minutes until the cheese is melted and the bread is golden brown. Yum! This recipe turned out so good. 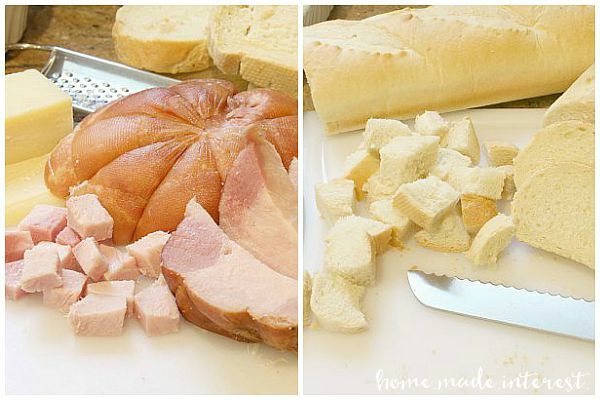 I love the soft, fluffy bread and eggs with the smokey ham and subtly nutty cheeses. Being able to make it ahead of time makes it perfect for serving to a big group. Anything that lets me sleep a little later it a winner in my book. Now it is your turn go check out the Boar’s Head SmokeMaster™ Smokehouse Rules for your chance to win a $50 Gift Card to be used for the purchase of Boar’s Head SmokeMaster Black Forest Ham. There are 2 ways to win 1) Comment on a Smoke House Rule post on Facebook 2) Reply to a Smoke House Rule Tweet with @Boars_Head and #BHSmokeMasterSweeps. There will be 90 winners total throughout September, 5 winners for each Facebook and Twitter post. Today was RULE #8 QUESTION: What’s your go-to dish for celebrating? Drain the thawed spinach, using your hands to squeeze as much water from it as possible. Once the spinach is drained finely chop it. Heat a large skillet over medium heat and add butter and onions. Saute until onions soften. Place spinach in the pan and add 1/2 tsp of salt and 1/4 tsp of pepper. Once combined remove from heat. 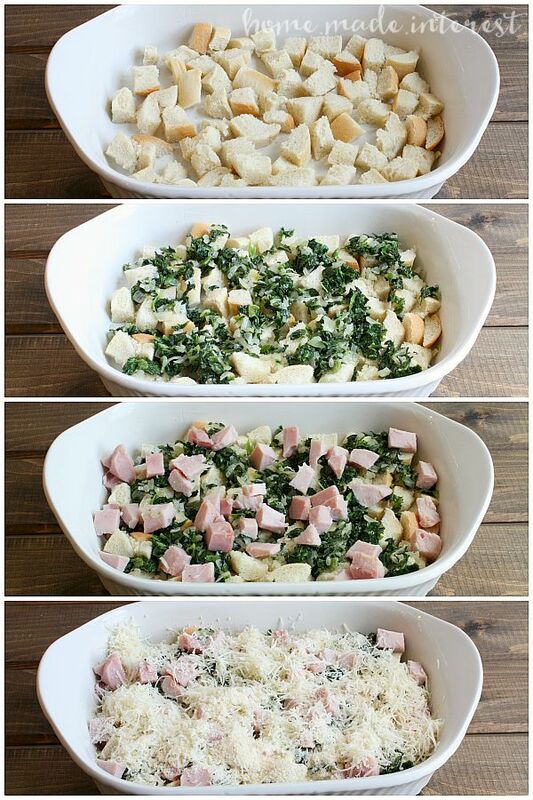 Mix the two cheeses together in a bowl. Grease a 3 quart gratin dish with butter and spread one third of the bread across the bottom of the dish. Next add a layer of spinach using 1/3 of the spinach mixture. Layer 1/3 of the ham on top of the spinach. Sprinkle 1/3 of the cheese over the ham. Repeat laying two more times. Whisk together eggs, milk, mustard, and 1/2 teaspoon of salt and 1/4 teaspoon of pepper. When ready to bake the strata preheat the oven to 350°F. Bake uncovered for 45-55 minutes or until puffed, golden brown, and cooked through. Let stand for 15-20 minutes before serving. Make ahead meals are everything! 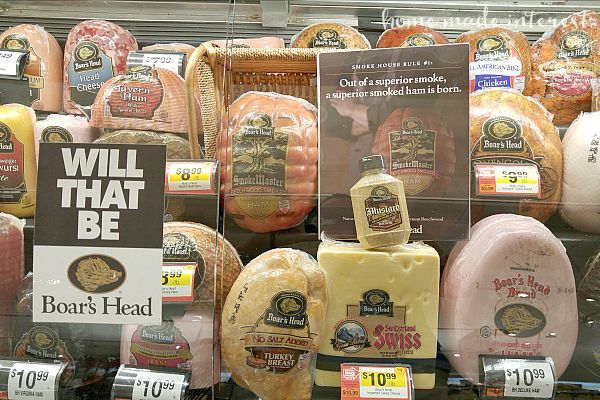 Love the gruyere and ham combo – sounds like perfection! 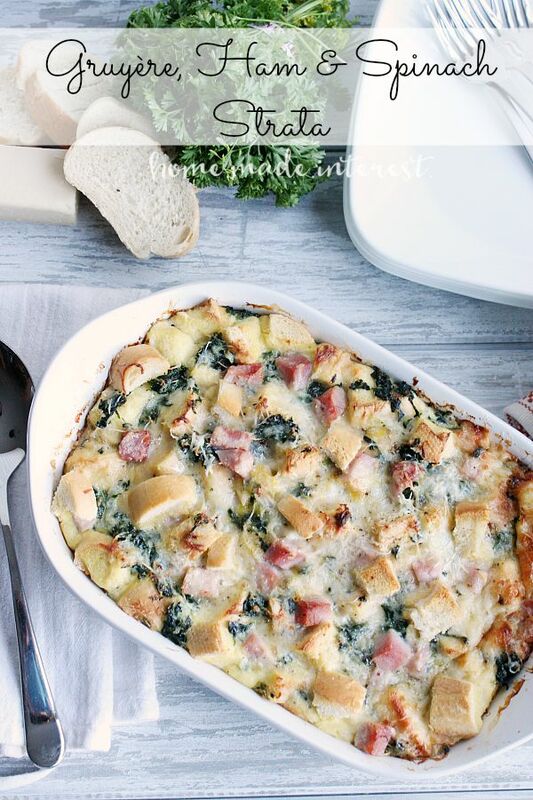 I love egg casserole and frittata, but I’ve never made strata. This looks delicious. I will have to give it a try. I love ham, cheese and spinach together. This looks like an excellent way to start your day! This looks really delicious! Thanks Cathy! 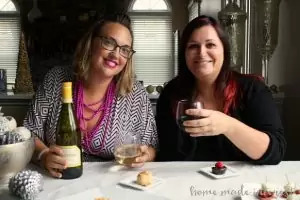 Even Melinda’s mom gave it the stamp of approval and that is saying something! Thank you for this recipe! Thank you for your directions and step by step photos. 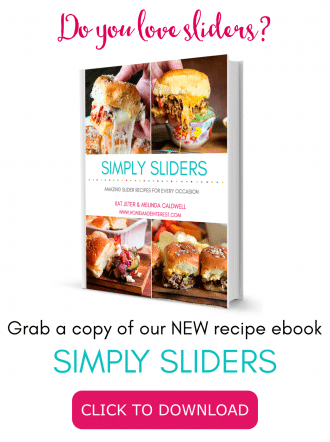 Just printed your recipe out! Thank you for this recipe. 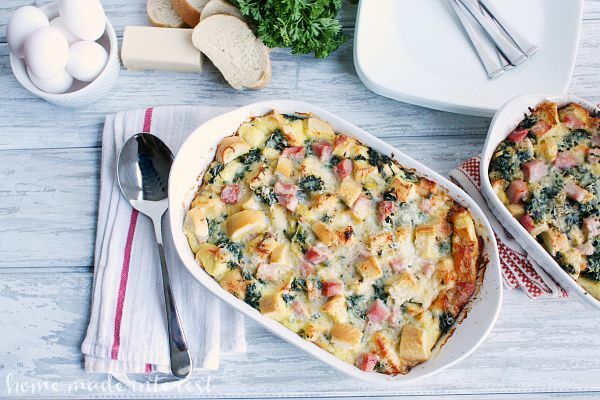 This is one of the best strata recipes that I have ever made. I just made it for a holiday brunch and my guests ate the entire casserole. The combination of the high quality ham cut into large pieces, the french bread, and the Gruyere cheese mixed with the Parmigiano-Reggiano was delicious. This is now my favorite strata! I’m so glad you liked it! 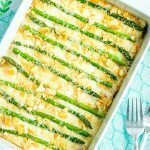 It was my first strata and I couldn’t believe how easy it was.